There comes a time in every mini-lathe owner’s career when the prospect of “upgrading” comes into focus. In my experience, this often happens when visiting websites of your local home metalworking workshop machine tool supplier. You may well visit the website of your local hobby machine tool distributor for perfectly legitimate reasons. It might be that you need to purchase some new drill bits, or an accessory for your mini-lathe. Whilst on such websites it is almost impossible to avoid the section showing machines similar to your mini-lathe for sale. Unfortunately, these very same pages will doubtless list larger machines. Larger machines attract the attention of small lathe owners in the same way that sailors are drawn to the seedier parts of town. 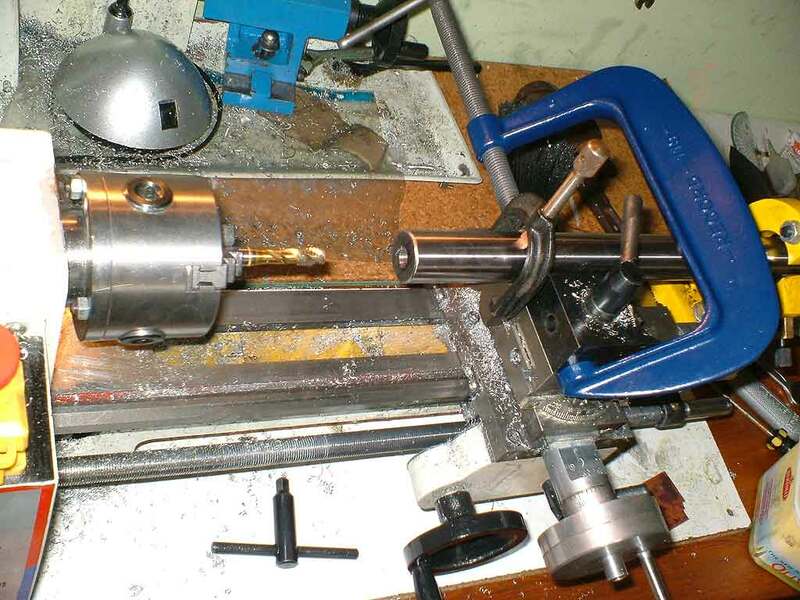 Another contributory factor is those inevitable occasions when you are using your mini-lathe and it can’t quite handle to job you want it to do. A perfectly normal reaction is to start thinking about whether it is time for a bigger lathe. Now, the truth of the matter is, you can usually find a way around these problems. If the problem is fundamental, like not enough swing over the bed, then you’ve no business embarking on projects needing such parts because it is going to put you into a dangerous situation with respect to lathe-desire. Often there is a solution. I recall trying to drill and tap a hole in the end of a 1m long 30mm diameter steel bar. Now, the mini-lathe spindle bore is only 20mm… so you can’t do this operation on the mini-lathe in the conventional fashion. I found an unconventional solution which enabled me to drill and tap a hole in the end of a oversized 30mm long round bar using a 20mm spindle bore mini-lathe As you can see this entailed various bits including a fixed steady and a V block from the milling machine accessories. So what is the logical next step up in lathe ownership after a mini-lathe? The 9x20 lathe comes in at about double the price of a mini-lathe. This is a much bigger and beefier machine than the mini-lathe. It has more power, bigger swing and a much longer bed, by most reports a fairly capable machine. It also neatly illustrates the major stumbling block in mini-lathe upgrading. The mini-lathe weighs about 35kg. Although it is a struggle, the average person can just about pick one up and move a short way (no pun intended). With two people, even of below average heftiness, moving it from room to room, or shed to car is not a challenge. A 9x20 lathe weighs over 125kg. This is 3.5times heavier than the mini-lathe. So even three burly men, should you happen to have them, are going to grunt a fair bit trying to move a 9x20 lathe. Think carefully about how this will impact on your lathe owning career. If you put a 9x20 on the same desk that held your mini-lathe, then the desk will stand a fairly good chance of collapsing. Actually, this is all assuming that you can get it from the delivery van to your desk. Perhaps your metalworking workshop is up a nice set of steps? Think carefully about the logistics of getting one of these into your workshop. Also think carefully about getting one out again – personal circumstances can change more rapidly than most people thing – and 125kg of cast iron can be an unwanted encumbrance at times. So think carefully. A new and bigger lathe is also going to invoke a massive secondary spending spree. You’ll be gripped with a feeding frenzy as you feel obliged to kit out your new lathe with every accessory you had for the mini-lathe. Be warned, as the size of the lathe increases, so does the size and cost of the accessories. Other upgrade options besides the standard 9x20 exist. The 7x12 mini-lathe has a variable speed motor controller - a boon for the beginner. Larger lathes often come with belt drives that require you to change gear to change the speed – mechanically more sensible, but not as convenient. Chester do a nice line of variable speed DB lathes, the smallest being the DB8 lathe. This look like good quality machines and I’ve been strongly tempted by one myself. Again, even the small one is 125kg, which normally stops me for a good while. There is an entirely different approach – go and find a nice second hand Myford or similar lathe in good condition. A nicely made UK or USA lathe is going to be a quality above the Sieg factory lathes – but as with buying any second hand machinery (e.g. a car) it is worth having somebody knowledgeable to help you. The same comments about gravity and accessorizing madness apply. As with anything second hand, EBay is a fun place to go play. Another factor you’ve got to bear in mind is the large degree of familiarity you’ve got with your current 7x12 mini-lathe. I know I can operate mine with my eyes proverbially closed. My hands and fingers know instinctively where to reach for all the controls. Mind you, I still keep loosing my 17mm spanner, despite owning three, but that is no fault of the lathe. With a new lathe you will have to be ready to climb up a whole new learning curve of an as-yet unknown gradient. Everything is going to be different. A fantastic mistake to make would involve buying a larger lathe because you’d suddenly found yourself with a large job to complete in a hurry. Such a buying approach will lead to tears. So there we are – we are all going to drool agog at websites of larger lathes… but please think very carefully before leaping in and buying one.